Your big day is fast approaching and you need to tackle the wedding rings. It’s a job you’ve been putting off as you’ve realised you’ll need a fitted wedding ring to sit alongside your engagement ring. Here is a guide to help you choose which design you like best. How would I know if I needed a fitted wedding band? A good number of engagement ring designs will require a fitted band so the two rings sit well together on the finger. 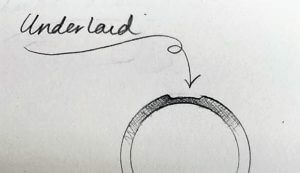 If you go for a straight, un-fitted band next to a ring that really requires a fitted band, you’ll end up wearing the setting down prematurely as the two rings will rub together. You can test whether your ring needs a fitted wedding ring by placing a straight band on your ring next to your engagement ring. 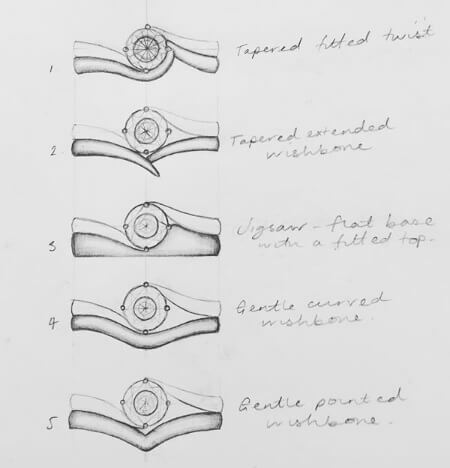 If the straight band will not slot under any settings or sit flush against the side of the engagement ring, you will need to consider a fitted band. 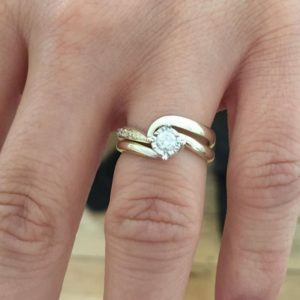 Charmaine’s engagement ring (pictured below) provides a good example of a ring which will not need a fitted wedding ring. Although her central diamond is wider that the width of the band, the setting is curved and the widest part will sit above a straight, unshaped wedding ring. The bottom of the setting is slimmer and does not protrude out from the shoulders of her ring. Some people do not like the idea of a shaped wedding ring because they think they would look odd if worn on their own. This is not necessarily the case – take a look at the design ideas below for some inspiration! Engagement rings like Michelle’s beautiful tourmaline and Palladium stunner will definitely need a fitted ring to slot up next to it. I’m currently working on a ring for Kelly who was having a really difficult time finding a fitted wedding ring she liked on the high street. 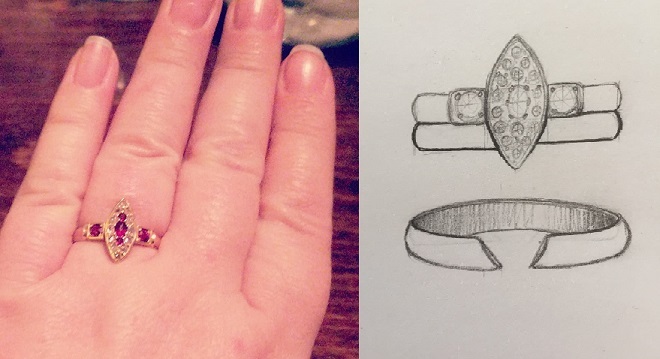 She wanted something special to complement the design of her twist engagement ring. We’ve gone for some pave set diamonds on one side of the wedding ring to complement the texture around the setting in her engagement ring. This added design feature makes the ring pretty in its own right to wear solo. Wishbone wedding rings are a classic solution for some fitted designs as their elegant shape looks great when worn on their own. These V-shaped rings work well next to solitaire (single stone) engagement rings – especially those with pointed elongated central stone shapes like marquise cut stones, but can work equally well with rounded shaped stones. Like the wishbone shape, a curved wedding ring flows around the shape of the engagement ring. Instead of having the definte V shape like a wishbone, the curved design is less angluar and suits engagement rings with round shaped stones. These can be the same width all the way around the band, slimmer at the front or straight on the bottom edge. Twist rings are ideal for sitting next to engagement rings that just need a little bit of extra room next to the central stone, so for example, if the central stone protrudes just a little from the width of the band, but enough to stop a straight band fit nicely beside it. Twist rings have a simple but very clever design where the band twists 180 degrees – the centre of the twist creates a slimmer section of the band to slot next to the engagement ring setting. These rings can look great on their own as well as next to the engagement ring because of their twist design feature. This shape looks a little bit like the cross over of the infinity symbol, which is very apt for a wedding band! A jigsaw or cut out shaped wedding ring will have a notch removed to allow for any protrusions from the engagement ring. This ensures a snug, gap-free fit and can stop the wedding ring from spinning, which is helpful if you like the idea of setting stones into the front of it. An open wedding ring is good for slotting around large central settings in your engagement ring that may be too pronounced for a full wedding band to be fitted around. It can look like the wedding ring is disappearing underneath the engagement ring setting, giving a gap-free and cohesive look. Some people are not comfortable with this design as they feel it might not look right if worn on its own and the gap in it contrasts with the symbolism of an unbroken circle of a traditional wedding ring, but if this doesn’t bother you, it can be a great option. Similarly to an open ring design, a cage wedding ring will usually have an opening for any large central setting area in your engagement ring, or sometimes the shape swoops around the engagement ring like a curved wedding band. 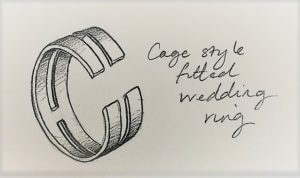 Cage style wedding rings create the look of a wedding ring either side of your engagement, which can look very balanced and symmetrical if that appeals to you. Your engagement ring will slot in between the two rings. There will be discrete bars at the side and back of the ring, which hold the two rings in place around your engagement ring. Underlaid wedding rings have a dip filed into them so that any protruding areas of the engagement ring can slot over it, without pushing the wedding ring down into your finger. 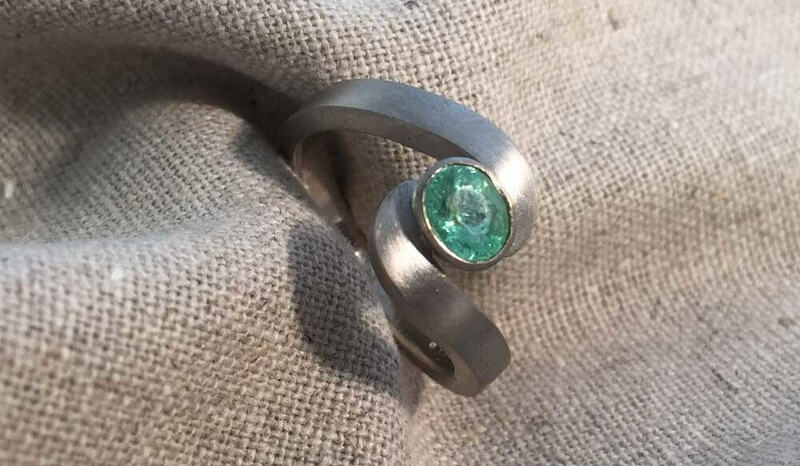 They can be an option for someone whose engagement ring really calls for an open or cage style wedding right, but who wants the seamless circle. This style will not work for every engagement ring, but it might work if your setting does not go the entire depth of the ring. the metal – do you want to match or contrast your engagement ring? the finish, width, depth, and profile – again, to match or contrast your engagement ring? any engraved or stone set details to complement your engagement ring. You can read more about these options here and see some examples of previous commissions in the gallery to gain some further inspiration.